Opener 22: Whiting Tennis, on view from September 3 – December 30, 2011, was the first solo museum show for Whiting Tennis. The exhibition included sculpture, painting, drawing, and collage from the past twelve years. During the installation of the exhibition, Tennis sat down with the Tang to discuss his artistic practice. Whiting Tennis finds inspiration in the timeworn provisional structures that inhabit the rural Northwest. 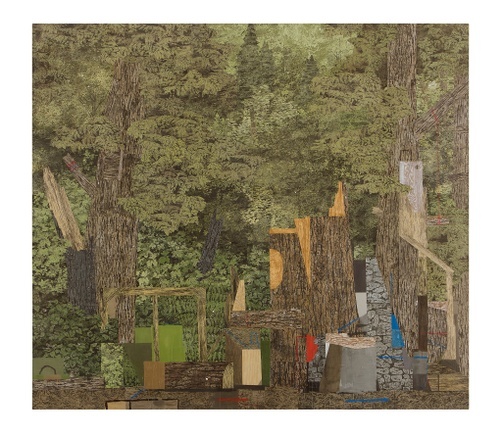 From a paint-splattered blue tarp to a pieced-together shed, Tennis’s art celebrates the weathered materials and everyday forms of often-overlooked objects. Born in 1959 in Hampton, Virginia, Whiting Tennis has lived in Buffalo, New York City, and Seattle, where he currently lives and works. Tennis, Whiting. “Whiting Tennis on the Unconscious Line.” 2011. Tang Teaching Museum collections website, last modified October 19, 2018. (https://tang.skidmore.edu/collection/explore/23-whiting-tennis).